A&L Goodbody has conducted its annual review of M&A transactions notified to Ireland's Competition and Consumer Protection Commission (CCPC). The review of Irish Merger Control in 2017 confirms a 7.5% increase in the number of M&A deals notified to the CCPC. In 2017, 72 M&A deals were notified compared to 67 deals in 2016 and 78 M&A deals in 2015. The most active sectors for M&A deals notified to the CCPC during 2017 were the energy, food and drink, and media, telecoms and broadcasting sectors. Dr Vincent Power, partner and head of EU and Competition in A&L Goodbody said: "The list of notifications during 2017 was a very wide ranging list from acquisitions by billion dollar funds to the sale of convenience stores. 2017 proves that the Irish regime captures a very wide net of deals." 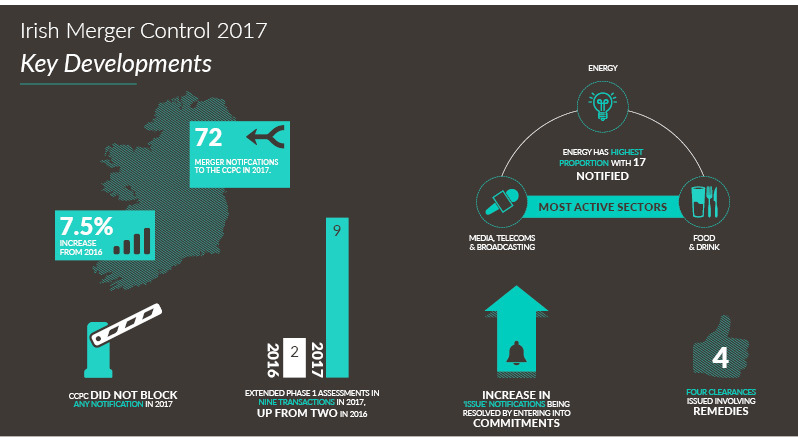 2017 saw a higher number of energy deals requiring notification to the CCPC with a total of 17 transactions being notified to the CCPC. This represents the highest proportion of notified transactions in any one sector. The CCPC undertook extended Phase 1 assessments in nine transactions in 2017 (with two assessments remaining active into 2018). This is an increase from the two extended Phase 1 assessments undertaken by the CCPC in 2016. The CCPC did not prohibit any notification in 2017. A low level of prohibition is consistent with international practice. In 2017, there were four clearances issued by the CCPC involving commitments offered by the parties, double that of 2016. While the CCPC is taking a shorter time to review notifications without competition issues, there seems to be an increase in 'issue' notifications being resolved with commitments (involving both structural and behavioural remedies). These notifications involved extended Phase 1 assessments by the CCPC and the parties offering a number of commitments to the CCPC to obtain a Phase 1 approval. These commitments included a mixture of structural remedies (such as divestment of assets) and behavioural remedies (such as future pricing guarantees and the management of information). Some important pointers as to how media plurality in Ireland is likely to be interpreted in the context of future media mergers were given in 2017 following the Phase 2 assessment of the Independent News & Media/CML notification and the extended Phase 1 assessment of the Twenty-First Century Fox/Sky notification to the Minister for Communications, Climate Action and Environment. The Department of Business, Enterprise and Innovation launched a public consultation on 29 September 2017 regarding a review of certain Irish merger control provisions, the most important of which relates to whether the current financial thresholds for mandatory notifications should be increased. Dr Power also added: "It is too early to see a definite pattern because of Brexit. But some implications of Brexit on M&A are becoming clearer. First, if the UK leaves the EU and there is no special deal done on merger control then far fewer Irish-centred M&A deals will be notified to Brussels because these deals will often lack sufficient EU turnover – at present, the UK-related turnover counts as EU turnover and that is what tips the balance in many Irish-related deals. Converting UK turnover to non-EU turnover would take most of the Irish deals which have gone to Brussels out of the EU net. This would ordinarily mean more notifications across the EU for Irish businesses. Secondly, the UK could well introduce new criteria in merger control other than just competition post-Brexit (e.g., to protect UK interests) and the current regime liberal regime might not exist." For full details on the report, please see our Review of Irish Merger Control in 2017. For more information, contact any member of the EU, Competition & Procurement Group at A&L Goodbody.